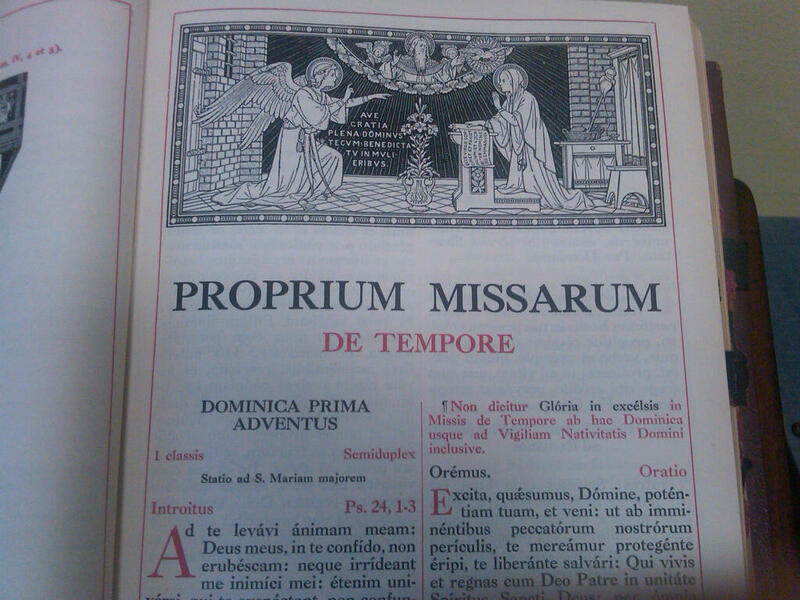 Advent, which begins tomorrow tonight, is largely about time. Be vigilant at all times, Jesus says, and pray that you have the strength to escape the tribulations that are imminent and to stand before the Son of Man (Luke 21:36). Advent tries to take us out of our ordinary preoccupations with the passing details of our daily lives (important though they may be in themselves) and focus us on the bigger picture – graphically captured by the image of the end of time. Of course, there is nothing we can do about the end of time. It’s what happens at that end of time that matters and that we are able to prepare for – the blessed hope and the coming of our Savior, Jesus Christ (for which we pray every day at Mass). Advent recalls our memory of Christ’s 1st Coming (which we celebrate at Christmas) to focus our attention on Christ’s 2nd Coming (for which we are waiting). Advent recalls the joy of Christ’s 1st Coming at Christmas to focus our hope (our “blessed hope”) for Christ’s 2nd Coming (his full and final Advent). Meanwhile, Advent captures the experience of where we are now – in this in-between time – between Christmas and the End. So Jesus’ instructions to us are less about the End than about the Now – what we need to be doing now in order to be the people we hope to be at the end. The point is not about trying to make discoveries about the future of the universe, but rather to discover – through the signs we experience in the here and now – that our redemption really is at hand. The Advent Wreath is a folkloric custom which signifies the intersection of eternity (represented by the circular wreath) and time (represented by the four candles), which happened in the Incarnation, when the Son of God came down from heaven, and by the Holy Spirit was incarnate of the Virgin Mary, and became man. This “Year of Faith,” when we are reflecting more fully upon the meaning of the words of the Creed, Advent invites us to take those words to heart and cause them to infuse those “passing details of our daily lives” with deeper meaning and confident hope. We have all become used to what were once private indiscretions now all becoming instantly public - in most cases to nobody's real benefit (except, I suppose, media scandalmongers who thrive on such things). Now it seems even individual and private acts of charity are likely to get captured by someone's smartphone and sent around the world - or, to use the common current expression, "go viral." 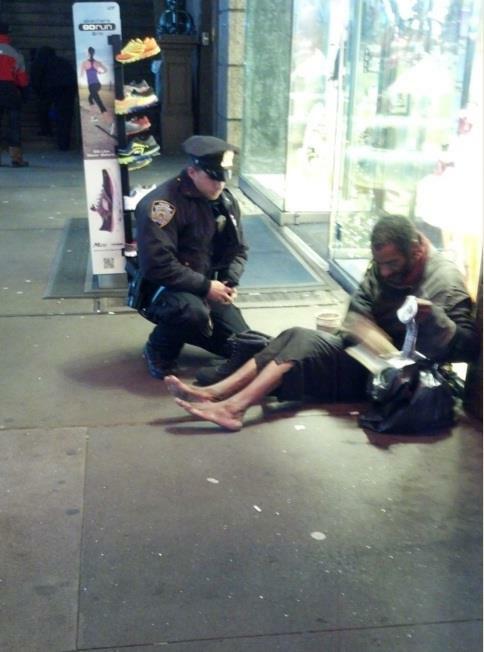 I'm referring, of course, to the story - and the picture - of NYPD Sixth Precinct Officer Larry De Primo supplying a barefoot homeless man with a pair of $75 insulated boots on a cold night in Manhattan. The location was 7th Avenue at 44th Street. The date was November 14. Were it not for a tourist from Arizona taking the picture, none of us would ever have known - much less seen - how Officer De Primo went into a local store and bought a pair of insulated winter boots and thermal socks, then knelt down, and put them on the man. Unlike the scandals of people's private indiscretions going public, scandals which bring us no tangible benefit beyond entertainment, this individual act of private charity benefits us all - not just the poor man whose freezing feet were warmed by a policeman's warm heart - but all of us who hopefully may be moved to do something similar some day, some time, to someone, somewhere. Once a year, we priests make a show of washing the feet of a few of our parishioners - in ritual imitation of Jesus' radically disconcerting behavior at the Last Supper [John 13:1-15]. Some sects take Jesus' instruction more literally and wash one another's feet on a regular basis. Perhaps that's their way of proclaiming the death of the Lord until he comes [1 Corinthians 11:26]. The important point is that while we wait - in this in-between time (as I like to say, between Christmas and the End) - that we keep on proclaiming. Putting a pair of insulated boots and thermal socks on someone's freezing feet is certainly not the only way to do that, but it surely is a wonderful way. As everyone who has seen the movie Lincoln now knows, a lame-duck 38th Congress passed the 13th Amendment to the U.S. Constitution on January 31, 1865. (It was quickly ratified by the states and became part of the constitution on December 6 of that same year). To a contemporary observer, what may seem most striking about that date is that was January 31 and not the late hours of March 3 or even the pre-noon hours on March 4. In other words, it was a whole month (plus a few days) before the end of the session and the expiration of the congressmen's terms of office. (In those pre-20th Amendment days, the lame-duck session and the terms of both President and Congress expired at noon on March 4). We tend to think of the pace of activity as slower in the 19th century than in our own supposedly more advanced era, when it comes to Congress it seems such notions just don't apply! As we careen crelessly toward the so-called "fiscal cliff," we are being treated to plenty of posturing (and probably a lot of bluffing) as both sides stake out their relatively irreconcilable positions. It is widely hoped that some sort of bagain ("grand" or otherwise) will be struck, probably just in the nick of time. It is somewhat stereotypical student behavior to put off studying until the night before the exam or to delay writing that paper until the ight before it is due. Of course, that is not a recipe for either effective learning of maintaining long-term sanity. So sensible people - adults - generally frown upon such behavior and try to steer students away from it. Congress, however, seems impervious to such lessons and seems only able to do its job under the pressure of an immediate deadline. So why not just do it? Of course, we are not under a "veil of ignorance" and are not from Mars, and so we know all too well from which outcomes we would likely benefit. The common good being therefore inaccessible, the next best thing would be a genuine compromise that would give those who won the election much of what they want, while giving the losers enough to persuade to win over some of their votes, thus at least indirectly moving us in the direction of the common good. Such a compromise would take time to negotiate, of course, but the "fiscal cliff" has been aroung for a while, and plenty of people have thought about what such a bargain would need to look like. So why not do it now? Unfortunately, settling now (rather than at the last minute) seems like being too ready, too willing, to compromise. To avoid that impression, one must pander to one's "base" by posturing almost to the last minute. That's what makes Congress seem so similar to the circus (except that the cricus is intended to be entertaining). But it is really worse than that. If legislation as circus act produced a just and equitable final product, perhaps it might be worth it. But what the posturing and bluffing so often do is make real deliberation and debate all that much more difficult. "Negotiating" becomes just an extension of public posturing, and the line between the two eventually vanishes - with the result that the end product is often inadequate. After all, the current "fiscal cliff" is itself a product of an earlier, dusfunctional negotiation! Perhaps the Presidnet needs to learn a lesson from Lincoln. Be clear about what is important, about what has priority, about what is negotiable and what is not, and then get to work solidifying one's coalition and picking off whatever additional stray votes can be gotten - and do it now. Given all that, the transition went wonderfully well on the whole. Most people managed to learn their new lines. And, if a year later many are still relying on their pew cards to get the Creed right, that’s hardly a serious problem. And we keep practicing. So, for example, as part of our observance of the year of Faith at my parish, we have included recitation of the Nicene Creed in our 1st-Friday Adoration and have made the Nicene Creed a standard part of the opening prayer at parish staff and pastoral council meetings, etc. That serves the purpose in this Year of Faith of helping us all to internalize and appropriate the central doctrines of our faith, while at the same time getting more practice learning the words which express our common faith. Of course, it is the priest who has had the most unlearning of old words and learning of new ones to do. The 1970 translation was so weak, so pedestrian, and so unfaithful to the actual text that almost anything might have been an improvement. Still, old words and old phrases linger in one’s linguistic reflexes. So it has been a real effort to re-learn familiar prayers. And, while there is a lot to be said for longer, more complex sentences, we have all of us in this Twitter generation lost a lot of our literary culture - with the result that speaking in longer, more complex sentences (as people routinely used to speak not that long ago) has become that much more of an effort. It requires actual attention to the text - preparing by reading the collects over beforehand, for example. One side benefit for me is that careful attention to the text and a text that is longer and more complex have resulted in a slower, more deliberate style of proclamation on my part. Since I still tend to speak at New York speed, a slower, more deliberate style of proclamation is probably a net benefit! The bottom line, of course, is that the text is what it is, and my obligation is to recite it faithfully, neither adding nor subtracting nor otherwise altering words in any way. The liturgy is not about comfort, much less about creativity. It is about fidelity. It belongs not to any individual but rather to the Church. As Vatican II insisted: “Therefore no other person, even if he be a priest, may add, remove, or change anything in the liturgy on his own authority” (Constitution on the Sacred Liturgy, 22, 3). With that in mind, let us pray! It’s hard not to notice that it’s the end of November. Thanksgiving has come and gone, and there is no mistaking the season’s main message: Christmas is coming! Personally, I’m just thrilled! I love Christmas, always have! Yet the Church chooses this Sunday to tell us not about Santa Claus coming to town but about Daniel’s apocalyptic vision [Daniel 7:13-14] of one like a Son of man coming on the clouds of heaven who received dominion, glory, and kingship - an everlasting dominion that shall not be taken away, a kingship that shall not be destroyed. Words like dominion, glory, and kingship are big, grand words. They suggest great things of epic proportions. They invoke the majestic splendor associated with a royal coronation. Indeed, if one didn’t know better, the Thanksgiving and Christmas-themed parades so many cities see at this time of year might easily be interpreted as some sort of royal occasion, with Santa Claus coming to town as king. Daniel, however, seems to have had something more like the real thing in mind. In the case of real royalty, the point is that a particular person (whose whole identity is connected with this role) symbolically unites a community by a powerful personal bond – a bond so powerful precisely because so personal, a bond so personal that, through all of human history few, if any, institutions have served so successfully at building and bonding and unifying communities as has the institution of kingship. And so today, at this pivotal turning-point in the Church’s annual seasonal cycle, we celebrate the powerful, personal bond we share in and with Jesus Christ, who is our King with all the symbolic splendor and rhetorical power that the word king conveys. So what was it about Jesus being a king that perturbed Pilate [John 18:33-37] so much? It is in the nature of political office to involve power over others. The more exalted the office, the more power over more and more others, culminating in the sort of sovereign power Pilate had in mind when he worried whether Jesus’ kingship represented a threat to the imperial power Pilate represented. Jesus’ sovereignty, however, is different. Whereas worldly rule inherently involves the exercise of power over others, Jesus’ royal rule represents power for others. Jesus Christ is the faithful witness, the first born of the dead and ruler of the kings of the earth … who loves us and has freed us from our sins by his blood [Revelation 1:5]. Notice, the book of Revelation says his blood, not the blood of his rivals or his competitors or his enemies, but his own blood. To that, Pilate answered with the perfect conversation-stopper, “What is truth?” A world, which wants to construct its own reality, has no need for truth. In that respect, Pilate was as modern (or maybe I should say post-modern) as they come. He clearly could not imagine that the question of truth could actually have a real answer. In contrast, Christ the King scandalized Pilate’s Roman sensibilities – as he similarly scandalizes our contemporary sensibilities – precisely by proposing the truth, not as something socially constructed, but as something that simply is, not as something we choose as one option among many, but as something we learn, something that, so to speak, chooses us. When the Book of Revelation refers to us – to the whole Church - as a kingdom of priests, in the first place that’s a reference back to the people of Israel, to whom God had said at Mount Sinai: You shall be to me a kingdom of priests, a holy nation. That didn’t mean that all Israelites were transformed from farmers or shepherds or whatever into Temple priests offering sacrifices all day long. There were still proper, professional priests provided for that. What it meant was that, as God’s Chosen People, the People of Israel would be the special link between God and the world, through whom (as promised to Abraham long ago) the whole world would find blessing. So, when the New Testament refers to the whole Church as a kingdom of priests, it’s telling us that all of us, together as his Church, have been put into a new relationship with God, which makes us the special vehicle through which the whole world will experience blessing. As subjects of Christ the King, as citizens of his kingdom, we have become Christ’s face and voice in the world, perhaps (as has been said so often) the only face and voice of Christ that many will ever see or hear. So, in a very real sense, this celebration is ultimately about all of us, the Church, for to celebrate the king is to celebrate his kingdom, the kingdom he has made us into – a kingdom of priests for his God and Father [Revelation 1:6]. As subjects of Christ the King, as citizens of his kingdom, therefore, we too must testify to the truth in all aspects of life - witnessing to the truth in our relationships with one another and the wider world. To celebrate Christ’s kingship and to pray (as we do every day at Mass) for the coming of his kingdom, is to commit ourselves to the fullest extension of that kingdom to this world – so that this yearly celebration of Christ the King becomes not just an annual ritual marking the passing of the seasons, but the deepest expression of what we believe and who we hope to be. Homily, Solemnity of Our Lord jesus Christ, King of the Universe, Immaculate Conception Church, Knoxville, TN, November 25, 2012. “Politics means a slow, powerful drilling through hard boards, with a mixture of passion and a sense of proportion.” So said Max Weber in his famous 1919 essay “Politics as a Vocation.” Weber's dictum is superbly illustrated in the wonderful new Spielberg movie, Lincoln, which I saw earlier today - a superior alternative in every way to the media-enhanced, shopping idiocy of "Black Friday." It's a longer than average movie, but one well worth the time it takes and the investment of attention it requires. The film's superb acting dramatizes the events surrounding the passage of the 13th Amendment by the Lame Duck Congress in January 1865. Lincoln's struggle to translate his life-long hatred of slavery into constitutional reality through the (then-as-now) less than perfect medium of the United States House of Representatives is sensitively portrayed - a portrayal that simultaneously highlights Lincoln's commitment to the principle of abolition and his superb sensitivity to the political context within which he had to work. In the process, the viewer is invited to appreciate the terrible tragedy that was the Civil War, its incredible toll in human lives and casualties, the challenges so many serious (and many not so serious) politicians faced in simultaneously trying to save the Union and end the scourge of slavery, and lastly the tremendous personal toll on Lincoln himself, his wife (whose anxieties and sufferings are more sensitively portrayed than Mary Lincoln has usually been), and his sons. Slavery was the "original sin" of the American experiment, and its painful legacy still haunts our nation. It did, after all, cause a bloody civil war, which in the final scene (of Lincoln's 2nd Inaugural) is interpreted by Lincoln as God's judgment upon the United States for the sin of slavery. No tragedy in American history can quite compare with either the Civil War and the twin evils - the sins of slavery and secession - that produced it. That said, the movie makes a larger point about the interplay of principle and practical politics - and about the need for personal engagement on the part of the President in implementing his agenda. This film is an excellent civics lesson in the theory and practice of democratic politics and presidential leadership. As such, it deserves serious study on the part of today's political actors - and everyone else. The challenges facing the current Lame Duck Congress cannot compare, of course, to the abolition of slavery and the prosecution of the Civil War. But they are serious challenges that touch on issues of fundamental principle (not least the fundamental principle of equality and what that must mean in actual practice). The issues facing this Lame Duck Congress will likewise also have long-term ramifications for the country's moral meaning, as well as its fiscal condition. And, for a wholesome resolution to result, sustained, committed, effective presidential leadership will also once again be required. Apart from some regular grocery-shopping, my shopping needs are modest-to-minimal (and more and more of my minimal shopping is conducted on-line). Add to that an underlying, residual, anti-commercial, anti-market world-view, rooted in my academic formation and reinforced by religion, and one result over the years has been an almost complete indifference to such high holydays of American consumerism as Black Friday. I've known people who head for the mall in Black Friday's pre-dawn hours, but I've never been even remotely tempted to share in that experience. My attention has, however, been peaked by Black Friday's increasing intrusion into Thanksgiving Day itself, as more and more stores have started opening - some at midnight, some at 10:00 p.m., some even as early as 8:00 p.m. on Thanksgiving Day. Commenting on this dreadful development in today's Contra Costa Times, the director of the Retail Management Institute at Santa Clara University is quoted as saying: "Looking 10 years down the road, maybe we'll say, 'There used to be this nice holiday.' Thanksgiving will have disappeared." Just contemplate that: "Thanksgiving will have disappeared"! Of course, Thanksgiving won't quite "disappear." What will more likely happen is what's already happened to Sunday (which was universally a real holiday in the Western world from 321 A.D. until somewhere around the middle of my life-time). What will likely happen is what's already happened to most of our other "holidays," which used to have cultural and civic significance and were widely observed as such until living memory, but are now largely glorified shopping days. The inevitability of this dreadful development in our consumerist, capitalist culture is clear. Today's same Contra Costa Times quotes a Bay Area shopping center's director of marketing and business development as saying: "Just being here and seeing the huge volume of customers and the demand really opened our eyes. It's not something these retailers would be doing if they didn't see the demand." Given the unholy alliance of business greed and consumer greed, the obvious - and only - solution would have to be government legislation. That, of course, is what we used to have until relatively recently, when Sunday and holiday closing laws were common. Today's New York Times has an edifying article ("Where Pilgrims Landed, Thanksgiving is Kept at Table Not Mall") highlighting the beneficial survival of colonial-ear "Blue Laws" in Massachusetts, Maine, and Rhode Island, which, so far at least, are still somewhat protecting Thanksgiving Day. We have lost a lot that made life more humane - and continue to be losing a lot - thanks to the unholy alliance of these two forces which define contemporary culture. Sadly, Thanksgiving Day, until recently one of the least commercial and most traditional and familial of American holidays, seems on the way to becoming yet another casualty. Returning from the Paulist pastors' meeting in Washington, DC, last Thursday evening, I was so pleased to see Knoxville's airport decorated for Christmas. Then, on the way home, we stopped at the supermarket, where it was all Christmas Trees and poinsettias. We'd been away less than four days, but a big seasonal transition point had apparently arrived in the interim! This being my favorite time of the year, I always look forward to its arrival. There was a time when the Christmas season began with Thanksgiving Day. Growing up in my family, we waited excitedly for Santa Claus to arrive at the end of New York’s Macy’s Thanksgiving Day parade. Now, in many places, the season seems to begin right after Halloween. Thanksgiving itself comes as a brief but welcome pause in the increasingly hectic pace of the season. But, as I fly west to celebrate the holiday with my family, I am all the more conscious of Thanksgiving's importance for me personally and for our conflicted country as a whole. Thanksgiving and harvest festivals are, of course, quite common across the world. But the American Thanksgiving is a uniquely American holiday, our foundational feast, our ritual reenactment of our origin as a people. Thanksgiving is a civic celebration of who we are - by remembering who we have been - and so is also a symbol of who we hope to be. Few of us, of course, are descended for those original New England Pilgrims, whose history is at the hear of the American Thanksgiving holiday's history. Most of us are either immigrants ourselves or descendants of more recent immigrants. I, for one, come from the great wave of immigration from Sicily and southern Italy’s mezzogiorno, that inundated the Port of New York some three centuries after the Pilgrims had made their mark. Even now, almost four centuries after the Pilgrims, immigrants keep coming to this country. Thanksgiving is an especially appropriate occasion to acknowledge and celebrate our immigrant heritage and our continued openness as a nation to new immigrants, as each immigrant group continues to add something significant and distinctive and vital to our country’s cultural mix. Yet at Thanksgiving we must also recal those hardy New Englanders who early on first expressed the spirit of the new nation, which is what we celebrate at Thanksgiving - in a very appropriately Christian way, by giving thanks through the sharing of a meal. For most of us, it is hard even to imagine what it must have been like to have embarked upon so hazardous an enterprise as did the Pilgrims (although the more recent memories of immigrant relatives and the ever-present witness of immigrants in our own country and in our local communities today should help us to appreciate the awesomeness of the experience). Certainly, something so vast and mysterious as the New World was bound to arouse all sorts of complex emotions among the settlers – both their brightest hopes and their darkest fears. But, interpreted in the light of faith, the unknown of the ocean crossing became for them something known as they recalled God’s Chosen People’s crossing of the Red Sea and the Jordan River. And, good Calvinists that they were, those early immigrants to New England recognized their religious and political community as an important part of what goes into the development of a good human life. The passage of time may make us feel more secure and contented than befits a truly pilgrim people. In the great ongoing struggle for the heart and soul of America, the Pilgrims’ legacy recalls an important dimension of our life together. Our New England forefathers knew only too well what we as a nation forget only at our peril, that what is worth hoping for in our individual and collective lives requires a real community. They remind us – as Thanksgiving Day was originally intended to remind us – that we are all ultimately dependent upon one another and upon God. Ours is a curiously credulous world. As orthodox Christian faith has waned as a cultural influence in the West, we’ve seen a renaissance of all sorts of non-Christian beliefs and practices, from astrology to whatever. We are (as N.T. Wright remarked in one of his books) an increasingly confused culture. We embrace every imaginable irrationality that may offer us a pseudo-spiritual new age shot in the arm, then lapsing back into Enlightenment rationalism only whenever needed to question authentically Christian religious beliefs. Then, at the other end of the spectrum, there are many people who sincerely profess authentic Christian beliefs but seem at the same time to be especially attracted to increasingly apocalyptic prophecies and predictions and dubious private revelations. Yet the same Jesus who told his hearers to be on the lookout for apocalypse and to recognize the signs of his coming, also assured them that “of that day or hour, no one knows" [Mark 13:32]. So, where is that supposed to leave us? What do we see happening in our world? What are we supposed to see and what does it portend? In this Sunday’s Gospel [Mark 13:24-32], Jesus made his ominous predictions just prior to Passover - in the springtime, when the fig tree sprouts leaves, a sure sign that summer is near. It is, however, in the autumn of the year that the church annually repeats this message. Autumn is the long-awaited and hoped-for season of harvest, when the year’s work finds fulfillment (the non-agricultural, post-industrial society version of that being, I suppose, the year-end bonus - for those who still get such things). Harvest, however, also marks an end. In nature, November vividly anticipates both the eventual end of the natural world and the eventual end of each individual one of us. Because our advanced technological lifestyle has allowed us to become disconnected from the rhythm of the natural world – perhaps too much so (as recent storms and our growing climate crisis may be telling us) – we may be less acutely conscious of such sentiments than were our ancestors as recently as a couple of generations ago. Accordingly, the Church symbolically compensates for our excess of civilization, recapturing for us that natural cyclical mood, as it recalls Christ’s warning words about the end – an end, which, in this unique case, actually comes first, preceding the long-awaited and hoped-for harvest, when the Son of Man coming in the clouds with great power and glory will send out the angels and gather his elect from the four winds, from the end of the earth to the end of the sky. And so we wait – not just for the end of the world, but for the individual end of each one of us, the end of that individual world of hopes and struggles that we are each so laboriously building from the fabric of our individual lives. And it is precisely how we wait that identifies what the Christian life in the world is all about. In other words, the Christian life is not about pinpointing that day or hour – all real or imagined private revelations and apocalyptic predictions notwithstanding. Nor is it about trying to identify in advance which of our neighbors, according to Daniel’s prophecy [Daniel 12:2], shall live forever and which shall be in everlasting horror and disgrace. On the contrary, the Christian life is all about the how in the now – how we live and what we love in the here and now, what we make of this interval until the end – in other words, the durability and quality of our commitment and faithfulness for the duration. That’s what matters most over the long haul and will determine who we will be for all eternity. That is the wisdom which shall shine like the splendor of the firmament and lead many to justice [Daniel 12:3]. Meanwhile, we are fortified for that long haul by the durability and quality of Jesus Christ’s commitment and faithfulness to his Father, the same Christ who took his seat forever at the right hand of God [Hebrews 10:12], since then has been waiting – waiting with us and for us. And that is about as good a summary of the Christian life in this passing world as one is likely to get! Over lunch today, I finally got to look at The Hope of the Gospel in Difficult Economic Times, the proposed "pastoral message on work, poverty, and the economy," that somewhat embarassingly flopped at last week's USCCB meeting. It's probably yet another symptom of our national political polarization (sadly now also part of the internal life of the Church in this country) that most comments tend to be completely on one side or the other. Of course, to be fair, it is in the nature of the case that the Bishops had to vote one way or the other, either to issue or not to issue the message. On the narrow issue of whether or not it should have been issued, one inevitably can only take one side. My own sense is that the Bishops probably chose rightly in not issuing it. That said, again to be fair, there is a lot that is well said in the draft. (Ultimately, its problem was not so much what it said but what it seemed to leave unsaid). In its favor, first of all, is the document's generally spiritual tone - as befits a message from the Church. Lobbyists do their thing; political parties produce platforms; and think tanks generate programatic policy proposals. The Church's mandate is different. It is distinclty spiritual in origin and nature, and its pronouncements - even on political and economic questions - should always reflect that. The statement is adamant that "economic systems and structures are at the service of the human person, and not the other way around" and that "People are not put on this earth to make economies function better; rather the health of an economy is judged by how well it serves the good of the human person. The matrix of relations that make up the economic life of a nation is meant to serve the common good." In the same vein, the document insists that "Economic institutions, governments, and businesses, even the most complex of them, are not uncontrollable and impersonal entitites. ... They are human institutions. They are as just and responsible, as truthful and generous, and as mindful fo the poor, as the people who administer them. Human relations are prior to purely economic relations involving contracts and legal exchanges. It is an error, as Pope Benedict XVI teaches, to think that economic dynamics should not be influenced by criteria of moral judgment." All well said - but all at a certain level of generality. Much commented on, for example, has been the apparent absence of explicit reference to labor unions. "Workers," we read, "enjoy the right to assemble and form associations, which has long been recognized by the Church's social Magisterium." Why the reluctance to use the actual word "unions"? Elsewhere the text speaks eloquently about the importance of good education as "the doorway to economic well-being." Wouldn't that have been an obivous place to say something about the unconscionable levels of debt so many students are forced to assume to get an education? That, at least, might have somewhat balanced the document's "worry" about our "national debt." One wonders whether, if the nation's poor and unemployed had been consulted, how many would have cited the "national debt" as one of their worries. Predictably, the document says good things about the respect due to immigrants. Importantly, it also recognizes the need to balance the invocation of "subsidiarity" language with the language of solidarity. It recognizes that "subsidiarity without solidarity risks a kind of 'social privatism' that lacks the vision and cohesion needed to be truly effective." (While it would be beyond the scope of such a pastoral message, I think perhaps the time may have come to re-evaluate the language of subsidiarity and perhaps even to retire the term). Critics have noted the absence of any reference to the Bishops' 1986 pastoral letter Economic Justice for All. That earlier document was much longer and considerably more detailed. It could be - and was - ctiticized by some for getting too specific in its recommendations. That document did, however, make very clear the difference between moral principles and policy proposals which are inevitably matters of prudential judgment and hence less certain and more open to legitimate debate and disagreement. It is important for those who speak officially in the name of the Church to respect the competences of others in secular disicplines and not presume to be equipped to resolve every issue. On the other hand, one of the things that enabled Economic Justice for All to have the impact that it had was that it did highlight the connection between principles with policies. It facilitated a real debate about policies in the light of principles. For whatever reason, this document appears shy about doing that. And that may have been its major weakness. Now that the election is over, it seems we all need something new to obsess about; and an obvious candidate has been found in the so-called "Fiscal Cliff," which we are supposedly facing (and possibly falling off of) in just another few weeks. One of the unfortunate counter-weights to the many genuine benefits of living in our modern meda-connected world is the burden of having to refer to things in silly ways. What will happen on January 1 is indeed a problem and an issue which warrants an active attempt at resolution. It is, however, a problem entirely of our own making. It is not some naturally occurring obstacle, which is what the imagery of a "cliff" connotes. The "Fiscal Cliff" is a direct consequence of our political system's failure to address important issues in anything resembling an adult way. When in 2011 it was necessary once again to raise the Debt Ceiling, the adult thing to have done, of course, would have been to do just that - to raise the Debt Ceiling. An adult does not order an expensive meal, eat it greedily, and then refuse to pay the check - which is what it means to vote against raising the Debt Ceiling, in other words to vote not to pay bills the Congress has already authorized and the country has accordingly incurred. Incredibly immature behavior on the part on one political party resulted in a compromise (too late, however, for the country's credit rating). The "stick" to guarantee that a workable compromise plan would be adopted was the threat of sequestration (combined by coincidence of calendar with the due date for the expiration of the Bush tax cuts). When Congress again failed to do its job, the "stick" that nobody really wanted remained and threatened to administer a severe economic beating to the country. The tax part of the crisis is the easier one to resolve. On January 1, the Bush tax cuts automatically expire, and so taxes will go up. There seems to be a bi-partisan consensus that this would not be such a good thing for the economy right now. There seems to be a bi-partisan consensus that the lower Bush-era tax rates should be continued for most taxpayers. The basic disagreement concerns the least justifiable of the Bush tax cuts - for those earning more than $250,000. The President has the obvious leverage here. All he has to do is be ready to sign a tax bill that keeps the lower tax rates for everyone else - except for those earning more than $250,000 - and to be ready to veto any bill that attempts to preserve the Bush tax cuts for the rich. That would put the opposition party in the position of either accepting higher taxes on the rich (which would upset only them and their rich clients) or making everyone pay higher taxes (which would upset most of the country). Sequestration raises much more complicated questions, since it is involves cutting the budget in areas people really care about. More on that another day! Meanwhile, it seems this would have been a good time to resume a serious moral reflection on the economy and the effects of economic policies on people. The US Bishops did this in 1986 in their landmark statement, Economic Justice for All, which perhaps we might all do well to reconsider in today's context. With those numbers, it's hard to believe it now, but it was almost an article of faith some 20 years ago that the Republicans had what was called a "lock" on the Electoral College. Between Lyndon Johnson's 1964 landslide and Bill Clinton's win in 1992, only one Democrat (the unfortunate Jimmy carter) had managed to win a term in the White House (and only one term at that). And, for all intents and purposes, the Western states were solidly, predictably Republican in presidential elections during that period. Then, everything changed. Bill Clinton won in 1992 and was re-elected in 1996 (in spite of the Republicans having regained control of Congress in 1994). In fact, in the six presidential elections from 1992 to 2012, the Democrats have won four of them - and won the popular vote in five out of the six! So much for the other party's "electoral lock." The first and most obvious political science lesson here is that things change. Realignments (in the classical 1936 sense of what political scientists call a "realigning election") are really recognizable as certain only in retrospect; and, of course, even genuine realignments are subject to eventual re-realignment the other way. The late 20th-century Republican "lock" on the electoral college (like the pre-1994 Democratic "lock" on the House of Representatives) was true - until it wasn't anymore. The 2008 election was widely seen as heralding another realignment - this time favoring the Democrats. That realignment seems to have been confirmed in 2012. And it will remain true - until (for whatever reason) it isn't anymore. That said, it's that "whatever reason" that should be the focus of interest. In 1992, two things worked in the Democrats' favor - Ross Perot's 3rd-party candidacy and Bill Clinton. Not only is Bill Clinton perhaps the best and most popular politician of his generation, he also moved the party back from the ideological and identity-politics precipice to which George McGovern and his heirs had taken it. Once again, the Democratic Party was a Center-Left party, rather than a Left-Left party. And in a fair contest between a Center-Left party with a Center-Right party, the former will more likely emerge the winner. But something else was also happening. As the Republican party moved more dramatically from being a Center-Right party to a Right-Right party, the Democrats were reverting to their earlier 20th-century status as the majority of the population's natural default party. Right at the time that the Republican Party was re-branding itself in the narrowest and most exclusivist terms, the composition of the electorate was changing forever. And the Democrats - as the broader and more inclusive party - became the prime beneficiaries. Demography is not entirely destiny. As George W. Bush's successes with Latino voters illustrated, Latinos could conceivably have gone either way. Latinos could hypothetically have evolved (and may yet someday evolve) the way the so-called "Catholic Vote" has evolved - a group so diverse in socio-economic status as to be broadly representative of the larger electorate. Latinos could have become a group both parties would have to fight for, with whatever party doing best among them likely winning the election. Nothing like that is happening right now, of course. That's attributable in part to the Republicans' problematic position on immigration, but also because the core ideology of the new Republican Party has so little to offer to anyone who isn't a Wall Street financier or a business owner. (Even so, extreme Republican rhetoric on immigration will likely have long-term symbolic significance for Latinos - much as Republican legislative efforts at voter suppression in several states may tar the Republican brand long-term with the relevant constituencies). So a real realignment has probably taken place. As with any such realignment, its strength lies in the evident fact that new voters, having entered the electorate identifying with one particular party, are likely to maintain that identificaiton - not necessarily for life (witness the aging, white, once-upon-a-time New Deal Democrats, who are now Republicans) but probably for several election cycles. The danger for the Democrats is equally evident. Just as internal forces within the Republican Party keep pushing it further rightward, internal forces in the Democratic Party may keep pushing it further leftward - especially on moral and cultural issues. To some extent, of course, that was what so undermined the New Deall coalition in the McGovern era, when the Democratic center in Washington could not control the the interest groups that constituted the party's base. Obviously, today's emerging electorate is younger and much more culturally liberal than the electorate of the 1970s and 1980s. So becoming a more Left-Left party is in the short term a winning strategy. In an era of dramatic economic and political change both at home and abroad, however, it is likely that other issues will dominate in the long-term. It was especially when the Democrats seemed to lose their way on those mainstream issues in the Carter era, when they were no longer perceived as the more trustworthy party on economic issues, that their majority evaporated. At present, the Democratis have regained the status not only of majority party but as the more trustowrthy party on economic issues. To remain the majority, being with younger and female voters on moral and cultural issues cannot - all by itself - substitute for that trust in the long-term. In our society, one of the surest predictors of poverty is being a divorced wife or a child of divorced parents. In most societies (including our own before Social Security and Medicare), widowhood potentially exposes a widowed wife and her children to the danger of poverty. Of course, there have always been rich widows. Typically, however, a widow would have been dependent on her family. If her family had little or no accumulated wealth – if her husband had been an ordinary wage laborer, for example – then the widow would have had to depend on other relatives or on the wider community. That was why the Early Church maintained an Order of Widows – to provide for their needs and to enable them in turn to contribute to the life of the larger community. For all these reasons, therefore, widows have often served as a suitable shorthand symbol for poverty and dependence. Hence, the two widows we just heard about today. The 1st widow, the pagan widow of Zarephath who provided hospitality to the prophet Elijah [1 Kings 17:10-16], was obviously poor – so much so that she told Elijah that she and her son were about to eat their last meal and then die. Generosity, however, often correlates inversely with one’s means. Despite her poverty, the widow provided hospitality to this prophet of a foreign God, and was well rewarded in return. The widow in today’s Gospel got no immediate reward in the context of the Gospel account [Mark 12:38-44]. Her role in the story seems mainly to highlight the contrast between her poverty and the more affluent pilgrims who were donating much larger sums to the Temple. The point is not that their donations were not of value or not appreciated or that they were somehow insincere in their donations. The point is rather that, being prosperous, they could easily afford it, at no great cost to their quality of life (as we might say today). The widow, however, contributed to the Temple out of her limited, meager means – revealing the generosity of her spirit and the seriousness of her commitment to what the Temple represented in her community. Perhaps few messages may seem more culturally challenging than the stories of those long-ago and far-away widows - and their counter-cultural (let alone counter-intuitive) message about being focused on something other than oneself and on one’s own individual needs, about not letting oneself and one’s all-important private world get in the way of one’s obligations to others and one’s connection with the larger human community. Ours is a society in which reality is increasingly subjective, in which the Individual has become the center of meaning and value, reducing family, community, and society to at-best secondary realities. Even churches sometimes seem more like clubs where like-minded or similarly situated individuals can feel good about themselves together. It is often suggested that prosperity and religion do not coexist well together. The decline of religion in much of the developed world today is sometimes cited as confirmation of that claim. Right now, of course, we are all conscious of the economic stresses that same developed world is undergoing, but the fact remains that we have all been culturally conditioned by affluence. So we are forever being tempted to privilege what is individual and private and personal over what is common and shared and bigger than ourselves. Jesus’ words are a repeated challenge to us all to rediscover what generosity actually means, what it means to be connected with one another in a larger community, and what commitment to one another and such a community actually requires of us. Jesus’ words are a challenge but also a lifelong invitation to what we can become – not just now but forever. Homily for the 32nd Sunday in Ordinary Time, Immaculate Conception Church, Knoxville, TN, November 11, 2012. 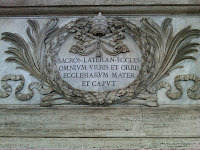 Today the Church commemorates the Dedication - on this date in 324 - of the Papal Archbasilica of St. John Lateran, the Pope's "cathedral" as Bishop of Rome, and hence (as the inscription says) Omnium Urbis et Orbis Ecclesiarum Mater et Caput ("Mother and head of all the Churches of the City and the World"). It is the oldest (and hence highest-ranking) of the major papal basilicas and one of the seven "pilgrimage" churches of Rome. The reliquary above the papal Altar contains the heads of SS. Peter and Paul. The Basilica gets its name from the Laterani family, whose palace originally occupied the site. When in the 4th century, the Emperor Constantine built the church – not in the center of what was still a very pagan city, but at the city's edge - the neighboring Lateran Palace became the papal residence. The whole complex functioned as the center of Christian life in Rome - until the Popes moved to Avignon, France, in the 14th century. When the popes returned to Rome in 1377, the Vatican replaced the Lateran as the Pope’s principal residence. 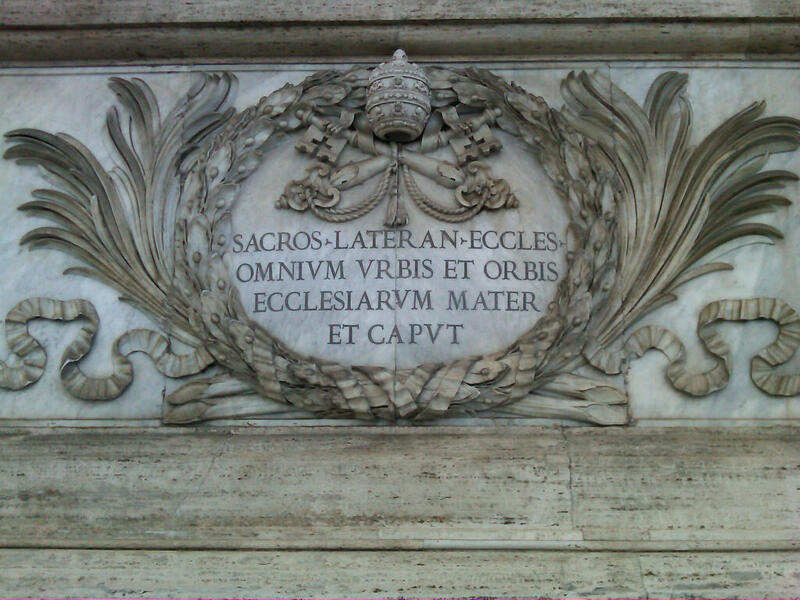 Still, up until the Kingdom of Italy put an end to papal rule in Rome in 1870, it remained customary to impart the Papal Blessing, Urbi et Orbi (“To the City and to the World)” from the Lateran on the feast of the Ascension, and also on the occasion of the enthronement of a new Pope. The historic coincidence of this feast's falling in November fits well with November's over-arching liturgical theme of the communion of saints. The solemnities of All Saints and All Souls on November 1 and 2 and the liturgy's annual eschatological emphasis highlight the temporal dimension of the communion of the saints - uniting us, past and present, across the limits of time. Today's feast focuses us on the spatial dimension of the communion of saints - uniting us, across space, "from the rising of the sun to its setting." As one universal Church, we are a communion of communities - local Churches organized and united around their Bishop, through whom they are united across space with the Bishop of Rome, the Pope, through whom we are also all united across time back to Peter. The visible unity of the Church across space and time which the ministry of Peter and his successors both effects and signifies seems especially relevant in our even more religiously fragmented century, in which the Church is constantly being challenged not just to proclaim its authoritative answers but also to incarnate a communal experience of the Body of Christ in the world, which responds to the deeper questions of people’s souls, both outside and inside the Church. It's done! The election is finally over - and much more decisively than some scenarios had predicted. While the political alignment in Congress hasn't changed much, overall it represents a real victory for President Obama and the Democratic Party. So what now? In policy terms, it means the major accomplishments of the 1st Obama Administration - the Affordable Care Act, Wall-Street reform - remain securely in place. Those hurdles having been passed, the time may have come to tackle tax reform and immigration. Whether Congress (with the House still in Republican hands) can rise to the occasion remains to be seen. Meanwhile, the so-called "Fiscal Cliff" might motivate some important moves. The Bush-era, deficit-increasing tax cuts will expire automatically on January 1, and "sequestration" will radically cut both discretionary domestic and defense spending. Buoyed by re-election, the President might be able to remain firm and face down congressional Republicans on these issues. In political terms, each party presumably has lessons to learn from the election. Losing is usually a greater incentive to learning than winning. So the immediate focus will probably be on the lessons the Republicans need to take away from their significant defeat. In a time of widespread economic distress, the Republicans nominated someone whose life and career personified the economic class that caused the problem in the first place - and whose proposed solution is to align the system even more narrowly in the interests of that class. That probably wasn't the most fortuitous choice of candidate for this year. Perhaps a more "man of the people" candidate (e.g., Chris Christie?) might have been able to do better. But the Republicans' problem went well beyond their choice of candidate. At heart, one suspects, Romney is really not very ideological, and is more of a pragmatic, problem-solver - who happened to be the candidate of a very ideological party. If the Republican Party were still the party of, say, Romney's father, perhaps he would have felt more free to make a more convincing case to the electorate. To win the nomination, however, he had embraced a whole set of extreme positions - on the auto bailout, on immigration, on healthcare, on taxes, etc. For the Republican Party to become a competitive national party again, it will have to have come up with something serious to offer to the majority of the population that aren't business owners. Perhaps the most obvious challenge for the Republicans, however, is the population itself. Romney was largely the choice of a shrinking component of the electorate - older and whiter (mainly male) voters. Obama won almost everyone else. If younger voters are settling into the Democratic Party, they are likely to remain Democrats, and it will take a lot for Republicans to dislodge them. And, of course, Obama won some 70% of the Latino vote. Yet, as recently as George W. Bush, who carried 44% of the Latino vote in 2004, it was possible to imagine the Republicans being competitive among Latino voters. The disrespect and hostility towards immigrants that has become Republican orthodoxy has paralyzed the party's ability to reach out to the largest growing ethnic group. The Republicans' problem is clear. The solution somewhat less so. What about the Church? In the aftermath of the French Revolution, some saw the best path for the Church in an alliance with the Old Regime and remained enthusiastic supporters of Restoration politics in 19th-century Europe. By the latter part of the century, however, that path hadn't succeeded, and an alternative path was obviously required. Pope Leo XIII encouraged French Catholics to make their peace with the French Republic, so that they could focus on other priorities. (The issue was not whether preferring the Old Regime was a good or bad political choice, but whether it was a religiously necessary choice). As was the case in Europe after the French Revolution, there are real challenges facing the Church in this increasingly secular culture - and serious threats to religious liberty from the secular cultural elite (e.g., the HHS Mandate, which hopefully will be overturned in the courts). As citizens, Catholics, of course, are all over the map in their political preferences - and that is probably all to the good. A problem arises, however, when political preferences are interpreted as religiously necessary preferences. In discerning a path to re-evangelize American society and guarantee religious liberty, it is important not to politicize religion, not to act as if the path is to be found in alliance with a particular political party. Whatever the path to re-evangelizing American society and preserving religious liberty, it is not likely to be by identifying the Church with support for regressive tax policies, opposition to universal health care, or hostility to immigrants (who just happen to be the growing group in the Catholic Church in the US). Hear, O Israel! The Lord is our God, the Lord alone! Therefore, you shall love the Lord, your God, with all your heart, and with all your soul, and with all your strength. Take to heart these words which I enjoin on you today. Take to heart! History attests how faithfully the Jewish People have followed this command of the Lord for all these thousands of years – in good times and in bad, in prosperity and in poverty, through centuries of persecution almost to the point of extermination. So certainly there was nothing surprising in Jesus’ answer to the scribe’s question. Of all the 613 commandments, there was really little doubt as to which should count as the first of all. The scribe had only asked Jesus which was the first of all the commandments. But, without being asked, Jesus added another: You shall love your neighbor as yourself. Both were taken from the Torah – the first from the Old Testament book of Deuteronomy, the second from the book of Leviticus. So neither commandment was new or unfamiliar to the scribe or anyone else in the audience. The novelty, if there was one, was in the way Jesus joined the two together. In doing so, Jesus expressed in words one of the implications of what God had done in joining together God and humanity in Jesus himself. In Jesus, God has joined us where we are, on our own turf, so to speak. In Jesus, God himself has become our neighbor. So we cannot possibly loved God and be unwilling to love our neighbor. This seems like an especially fitting Gospel for this 1st Sunday in November, when our attention is especially being called to our responsibilities as citizens. Political choices – whom or what party to vote for, who should benefit from tax policies, what to spend on and what not to spend on – all such choices are ultimately moral choices that express what we value, whom we care about enough to include and whom we’re willing to leave left out, and what kind of nation we want to be. We make such choices all the time, of course, but seldom so dramatically as on Election Day. The weather has dominated the news in much of the country this past week and in our national media. Of course, we talk about the weather and complain about it all the time. One reason for that is that it is something we really can’t control and the effects of which we all share in. At best, most of the time, we comfort ourselves by taking shelter from nature's fury. Hurricane Sandy and the many other major storms that increasingly characterize this time of climate change, have reminded us how ephemeral our shelters are, how fleeting the profits we prize so much, how vulnerable the structures we rely upon, how interconnected and dependent we are on one another, how helpless and defenseless we are alone, how desperately we need government to keep us together and marshal our common resources for the common good. A young person once asked me: Why study about Jesus? He’s dead, after all! Now, as a former political scientist and as a lover of history, I really do believe it is worth it to study the past – even (indeed especially) about people who are dead. But, more important than that, as a Christian, I believe Jesus is not dead but alive! That said, I also recognize that the only way that most people are ever going to believe that Jesus is alive is if the community that calls itself Christian really means what it says – when it says that Jesus is alive – and communicates that message by taking seriously Jesus’ joining of the 2 Great Commandments. Today’s Gospel reminds us that the shared challenge of citizenship is to consider the totality of one’s life – not just private life but our entire involvement in world we are part of – consider the totality of one’s life in the terms defined for us by the 2 Great Commandments, uniting our relationship with God and our relationship with one another. Homily for the 31st Sunday in Ordinary Time, Immaculate Conception Church, Knoxville, TN, November 4, 2012.